This is a kind of fine quality space saving storage bag, seal and vacuum design, perfect for packing your clothes, blankets, comforters, pillow and so on. Very convenient, you can have a try. Made of fine quality PET+PA. Save storage space of your home such as wardrobe to a large extent and increase your storage space. Helping home aider to organize down jacket, cotton quilt, blankets, pillows, sweaters, seasonal clothing and bedding. 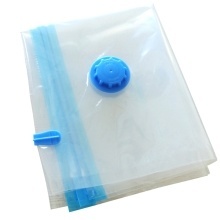 Super easy to use seal zip slider creates an airtight and waterproof seal. Made from fine quality materials specified for long term use. Protect your item against water, moist, bugs, moths, mildew, dirt, and odor. storing many kind of items, such as quilts, clothing, etc. Clothes should be clean and dry before put into the vacuum storage space saving bags. Total 12 sizes for you to choose, you can choose correct size according to your demands. Please avoid the heat and fire. Do not directly contact these bags with needles, nails and other hard objects in case of any damage. When closing the zipper，you should slowly pull from one end of the vacuum storage bag to the other end, repeat 2 or 3 times to ensure a tight seal.